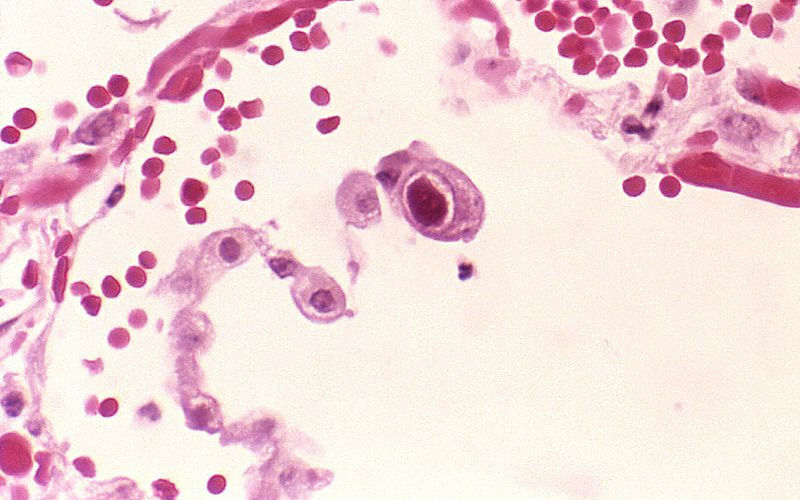 One of the commonest causes of congenital disability, the Human Cytomegalovirus (HCMV), is less prone to mutation than previously thought, a finding which could help develop a successful vaccine, UCL researchers have found. HCMV, a DNA virus and type of herpes virus, is one of the world's most common and widespread human infections, affecting between 45% to 100% of the adult population, depending on age and geographic area. While generally asymptomatic, HCMV is a concern for pregnant women, their unborn babies and patients with a weakened immune system. However, developing a vaccine has proved elusive. Previous global research has shown that within a single individual HCMV has high genome (genetic) diversity, leading to theories that HCMV has a high mutation rate. Such a trait is normally seen in RNA viruses, such as HIV or Hepatitis C, which in turn makes them hard to develop vaccines against. Now using new viral genome sequencing, bioinformatics and modelling tools developed at UCL, researchers have analysed immunocompromised patient blood samples and shown HCMV is not mutating any more than other DNA viruses. Instead, the frequent occurrence of mixed-infections caused by genetically different HCMV strains leads to findings of high genome diversity within an individual. The study, funded by the European Union, has been published in Proceedings of the National Academy of Sciences. Lead author, Professor Judith Breuer, said: “It has been claimed that HCMV is as diverse as the more error prone RNA viruses such as HIV and Hepatitis C Virus and this has led to a lot of confusion in the field. “Using our novel genome sequencing and bioinformatics modelling approaches, we have shown that the apparently high HCMV diversity seen in some clinical samples is caused not by HCMV mutation rather it is due to frequent co-infection with multiple strains of HCMV. Professor Breuer’s work focusses on the application of next generation deep genome sequencing, helping uncover new virus characteristics. The Breuer Lab has pioneered whole pathogen genome sequencing, by methods called ‘targeted enrichment’, to generate high quality whole viral genomes directly from clinical material, without the need for viral culture or polymerase chain reaction (PCR). She has combined these methods with cutting-edge bioinformatics including the newly developed Haplotype Reconstruction of Longitudinal Sequence Data (HaRoLD). Developed at UCL, HaRoLD is a new computational tool that applies Bayesian mixture models to reconstruct the genome sequence of each individual virus present in a sample containing multiple viruses. “This process is comparable to sorting several jigsaw puzzles that have been jumbled up together,” added Professor Breuer.